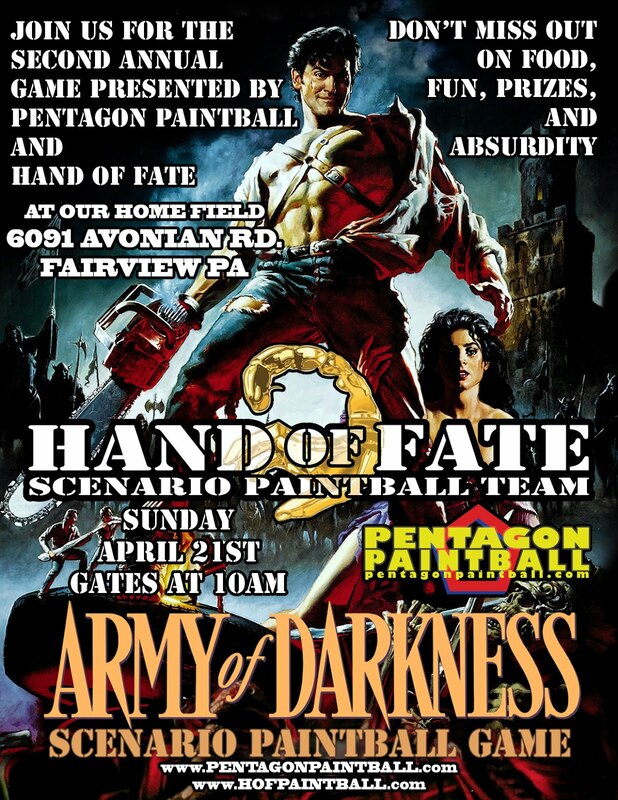 Hand of Fate will be producing their second Annual "Army of Darkness" Scenario event at Pentagon paintball on April 21st. There is a Facebook event created for this, please check that out! Feel free to share the attached flier with any of your paintball friends! Normal "Free Play Sunday" pricing for this event. This is a mission based game with a few breaks and role playing characters to interact with during the game. If you have never tried a scenario or even if you have, this will be something you will want to participate in! Cameras and video are welcome! For pricing, preregistrations or other questions about the field, feel free to call Pentagon Paintball 814-474-5580 (Wed-Sunday). If you have questions about the scenario feel free to contact me Sloppy Joe!